Hoping this finds you all enjoying your Monday evening, healthy and happy! It has been a crazy day for me, and at 3pm on Monday I just not getting this typed up for you! As most of you know my parents have been needing us to be with them more (us as in my siblings and I) as they have increasing health needs. Well my sister Anne was there a couple of weeks ago. My mom is always having us text or FB message each other with things she MUST tell us. Well she is always asking me about what I have been cooking and she cuts out recipes she thinks I need to try. Often she will say, "I would try this one, but I would take out this, and I would precook that, and I would etc....". She always has an opinion that one! I am SO glad I don't take after her! (what?!!??!?!) Anyway she was so adamant I get this recipe she had my sister photograph the newspaper clipping so I could get it made. I don't recall what the name of the recipe was on there, but, I am sure this isn't the first time some of you have heard of this or perhaps it is a staple at your house. I had never heard of it or eaten it so I gave it a try. This was undeniably a hit with my family. In fact, it was SUCH a hit, that the first time I made it, I didn't get to photograph it, because when I got around to doing it, it was GONE! HA! If it wasn't so easy to make, I might have minded more, but instead I just chuckled and made a second batch. I did a couple of things different the second time and liked it better. Nothing major, just, well......just keep reading!! Preheat your oven to 350 degrees F. Line your crackers up on your cookie sheet. My recipe says to fill in the edges with crackers you have broken apart. Forget about it. Just leave the space. Otherwise trying to even spread the topping on is a bit annoying. In a saucepan place butter, and brown sugar, heat until melted. Here is the next thing I changed. It says to add the nuts to the brown sugar and butter, however, I just sprinkled them on top the second time and like them better. SO....do as you wish but if covered by the toffee layer, they don't have much dimension to me. Perhaps I am particularly ridiculous, perhaps. They will get partially covered up anyway to be honest. 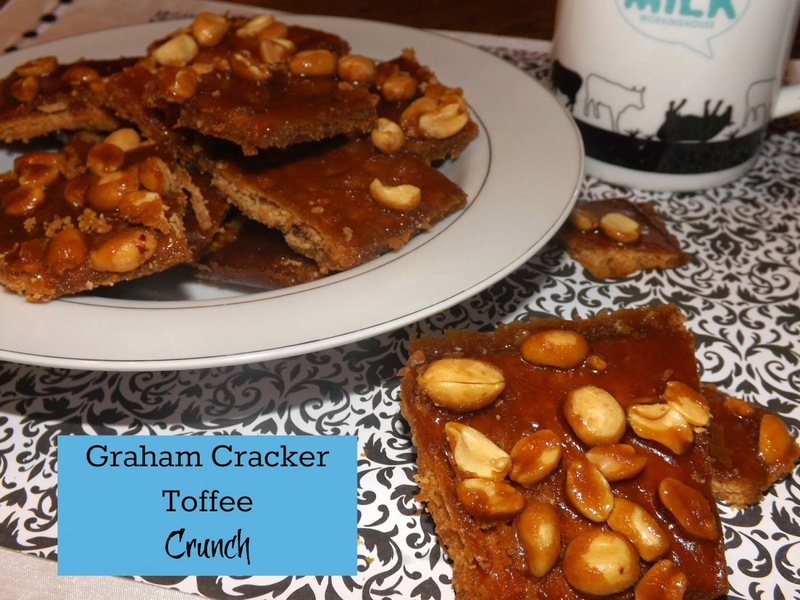 So add them in or don't, but pour evenly and then spread to cover your graham crackers. If you didn't add them sprinkle nuts on while the top is hot. Place in the oven and bake 10 minutes. Let cool completely, break apart and devour! This is dangerous stuff friends. Put on a safety vest, you are going to need saved, and I want you visible to your rescuer. I asked you all on Facebook what you thought the perfect sweet potato dish looked like. What would you put it in, what do you like it to have, and you all responded with SO MANY things! I saw everything from the way my mom and few of my sisters make them to entirely new perspectives. 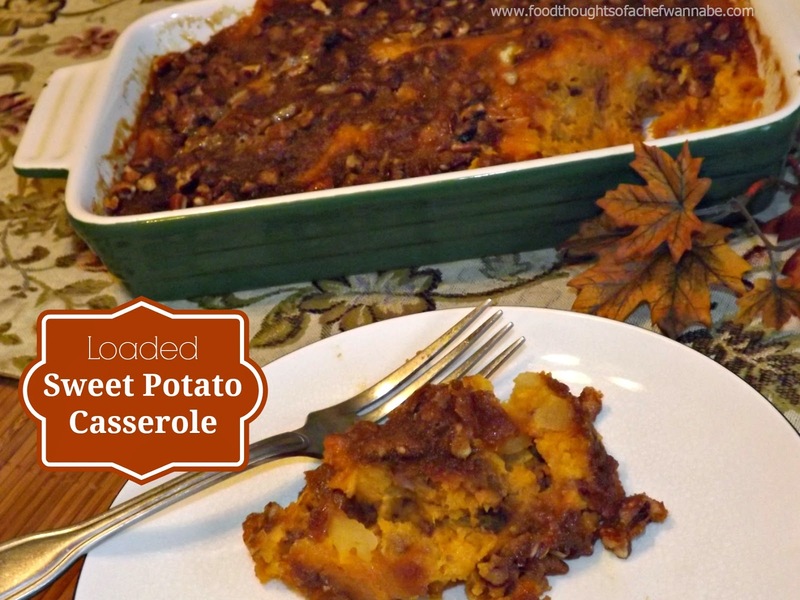 I wanted to create something new for my sweet potatoes and it came to me. If people can LOAD regular potatoes, why can't I load sweet potatoes?!?! I saw it all, brown sugar, pecans, butter, pineapple, marshmallows, the list went on and on. Though my mom was a canned yam woman, toss em' in a casserole, throw on some butter, brown sugar and 4 inches of marshmallows, I wanted something better than that. I didn't want mush, covered in gag me with a spoon amounts of sweetness. So here is what I did, and I hope you decide to try it. There is ONE thing I did not do, that I will do next time. I WILL add a few marshmallows to the TOP in the last 10 minutes of baking next time. Simply for that "old times" feeling and look. So here is the recipe, YOU wrote, with your comments!! Roast your sweet potatoes, skin on for about 45 minutes to 1 hour. Let them cool completely, cut the potatoes in half and scoop out the insides into a bowl. Now add the brown sugar, butter, salt, and eggs. Mix to combine completely. Now fold in the marshmallows and pecans, and place into about a 2 qt. casserole. So with all that being said, I am admittedly not a cranberry fan in general. There are exceptions to most rules, but, just in general, yeah, no thanks. 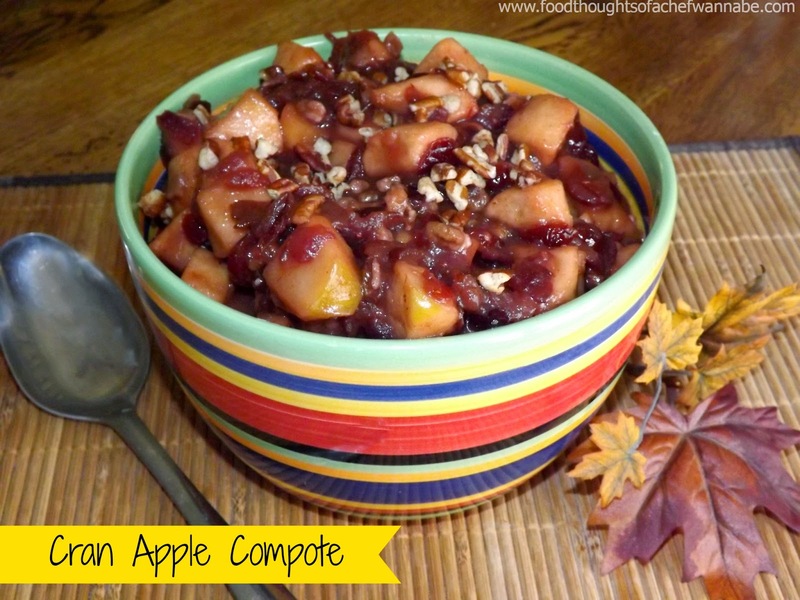 I wanted to come up with an alternative to cranberry jelly or gelatinous stuff. This has a thick little syrup, it is easier than ever to make, and people will think you are a genius. I can definitely see this on my Thanksgiving table, and I hope you put it on yours as well! The apples are your choice, I used, OMG, I can't remember what kind I used. You guys, I am dead serious. (laughing so hard). But use what you want. Don't fret over it, we will be adding a bit of sugar, and all will be well. In a saucepan combine cranberries, water, sugar and salt. Bring it to a boil, stirring often, and turn off the heat, but leave the pot on the burner. Let sit for 10 minutes. Stir in cinnamon, nutmeg, apples and 1/4 cup more water, bring back to a boil, stirring occasionally for about 15 minutes. When the apples have softened a bit, and the syrup has thickened, it is done! 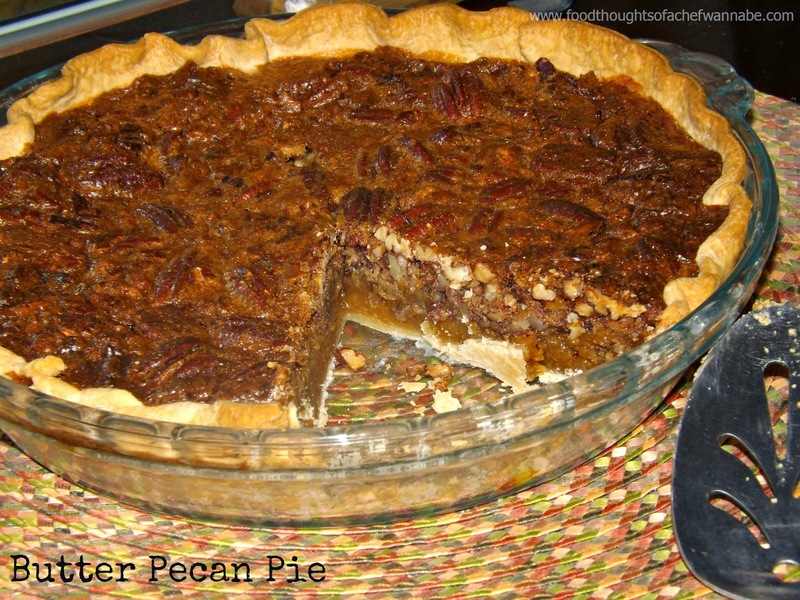 Make sure to sprinkle some extra pecan on top when you serve! I hope you "not so into cranberry sauce" people like me will enjoy this. I am not so into fruit period, but like a good foodie, I tried my own dish and it was amazing but, can I be honest and tell you what I did with the leftovers? Baby food........I processed it and froze it so my littles can enjoy it too! I can't keep it till Thanksgiving!!! Good Evening! It is starting to be REALLY chilly here in the Midwest. With the time change it is almost dark at 4:30, but truth be told, I don't really mind it. I mean, winter is supposed to be dark and snowy right? It isn't like I need it to be light until 9 to be out grillin' up a hog with the neighbors ya know? Anyway, how do you feel about the time change? As most of you know, I used to absolutely despise the slow cooker. I think I am reformed, sort of. I realize and understand many of you depend on them to feed your families great meals in such a busy world. I am slowly grasping it, and possibly loving it. To me slow cookers were to keep chili hot on game day, or meatballs hot, on game day! HAHA. I have been experimenting and this recipe turned out really well. I loved it. A little zing, a lot of flavor, a buttered toasted roll, tons of melty cheese, I mean, "git outta heeeaaa". I hope you enjoy these subs as much as we did, and the second day, the leftovers went into a nice salad! Add all ingredients to your slow cooker EXCEPT the chicken. Whisk together. Now turn each piece of chicken in the liquid mixture as you add it in. Turn your slow cooker to low for 5-6 hours or high for 3 hours. You can shred it or just piece it apart. 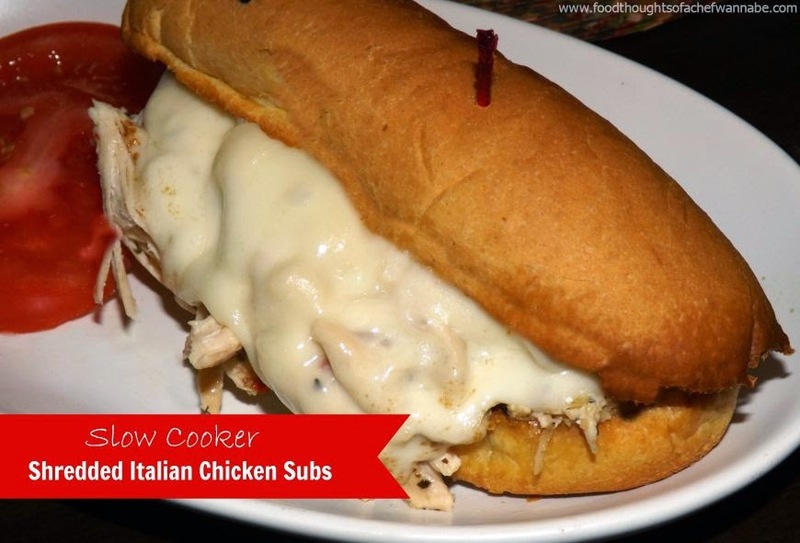 Place on a toasted sub roll, use plenty of provolone and melt under your broiler. Add a couple of slices of tomato and holy YUM! A hit with my family! Please just don't forget the buttered and toasted roll and cheese please! Pumpkin season is in full force and I tried, so hard, not to jump in with both feet, but I did. Well, actually I didn't. I bought one can of pumpkin and used it for 2 recipes. Fair enough? You know I let nothing go to waste, and it just burns me when I write or make a recipe that calls for half of a can of pumpkin. This year, instead of getting mad, I am getting even. I was sent a few awesome products by Yolli, a confectionery supplier. Oh my gosh...CUTEST stuff ever! I picked out these tiny, mini cardboard loaf form, called, "Mini-Backform". They come in a pack of 10 and are just about in between the size of a jumbo muffin and regular muffin, just in a loaf shape. I simply adore the print, and it stays so vibrant after baking, which is a huge plus for me. I am grateful they sent these and wanted to use the rest of that pumpkin for some cozy deliciousness! You can also find Yolli on Facebook as well! This recipe will make 10 of these mini forms, and I would guess 10 jumbo muffins as well. I can't even tell you how good these turned out, I just had to make my husband hide the rest, I keep picking at them. 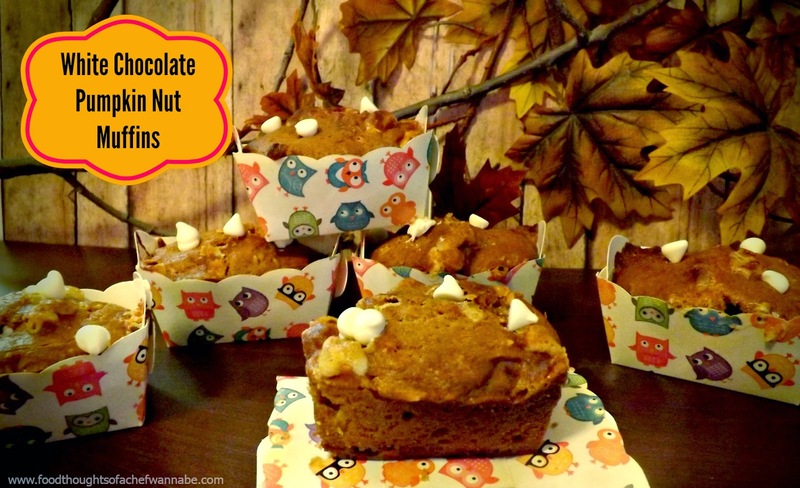 So let's get our hands dirty, and make these delightful bites of pumpkin sweetness! Get the coffee on! Preheat your oven to 375 degrees F. Line muffin tins with liners or get your little mini loaf forms put together. Cream together, sugars and butter. When it is nice and creamed together, add in one egg at a time and mix until smooth. Add in pumpkin, salt and sour cream and mix again. When it is well incorporated add in baking soda and cinnamon, and flour and mix until the flour is just absorbed. Don't over mix. Next toss in the nuts and chips and fold in or give them a quick whirl in your stand mixer. Fill your forms or liners. This should make 1 dozen cupcakes or 10 mini loaves. Bake for 20-25 minutes. A toothpick inserted in the center should come out clean. Sit back and enjoy, because there are one of the best things I have ever tasted! ENJOY! You will be seeing a couple of other products from Yolli coming up in holiday blogs. I can't get enough!! Disclaimer: All products were sent to me complimentary. All opinions are my own, and I was not, and never will be reimbursed for a favorable review of any product. Uh huh, and you thought these were just plain chocolate cupcakes with cute sprinkles. OH, NOOOO! These have so much personality!! Let me tell you why! I had Mexican hot chocolate a long time ago. It was SO good, I loved the little spiciness and tiny bit of heat on my tongue after I took a drink. It just warmed me right up. I was thinking about it again recently with the weather getting cold, but needed to make some cupcakes for some adults. I knew only adults would be eating them and I wanted to set off all of their gastro-intestinal alarms so I thought these would be awesome. Ok, just kidding. But the chocolate and the spice and the heat just all work and definitely an unexpected flavor combination. It isn't enough heat to bother most people and you can definitely use the lesser amount or even none at all. (or more!). These really are just a basic nice dark chocolate cupcake with the addition of a few ingredients. I will warn you the batter will be VERY thin. You did nothing wrong. They are so moist when they are done! I got about 32 cupcakes from this recipe. Do not fill your liners more than halfway full. The icing recipe will be exactly enough if you are piping and maybe a bit more if you are just spreading icing on so be generous if you are doing it that way. If I were making these for people I knew loved the heat I would have but a tiny sprinkle of cayenne on top. Instead, I used fun little fall sprinkles! Like I mentioned before, remove the cayenne and cinnamon if you want just a plain super moist delish chocolate cupcake. But I encourage you go for the gusto! Preheat your oven to 350 degrees F. Combine dry ingredients n a large bowl or in the bowl of your standing mixer. Add in remaining ingredients except boiling water, mix to combine. When well combine add in boiling water and mix again, just until the water is incorporated. This recipe will yield about 28-32 cupcakes. You could also make in a 9x13 pan. Cupcakes bake 20-25 minutes. If you are using a 9x13 bake it for 30-35 minutes! Let cool and let's make this creamy frosting! 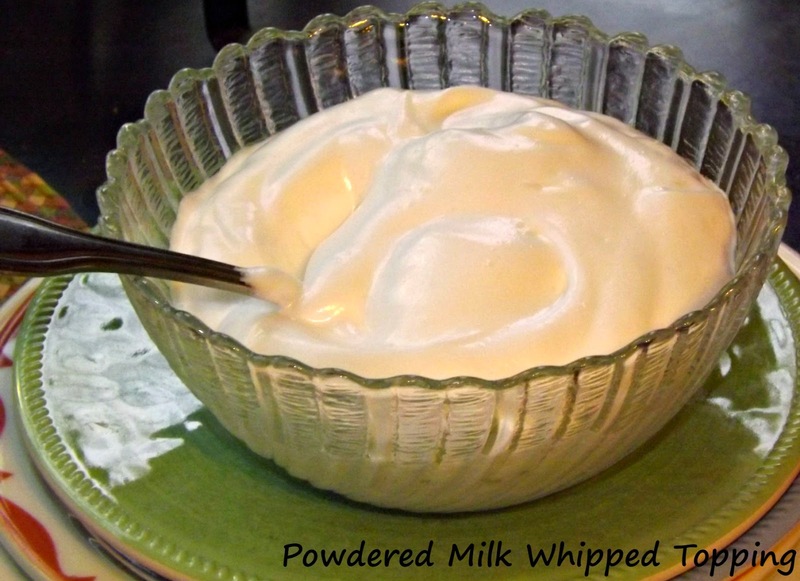 Mix all ingredients until smooth and creamy! 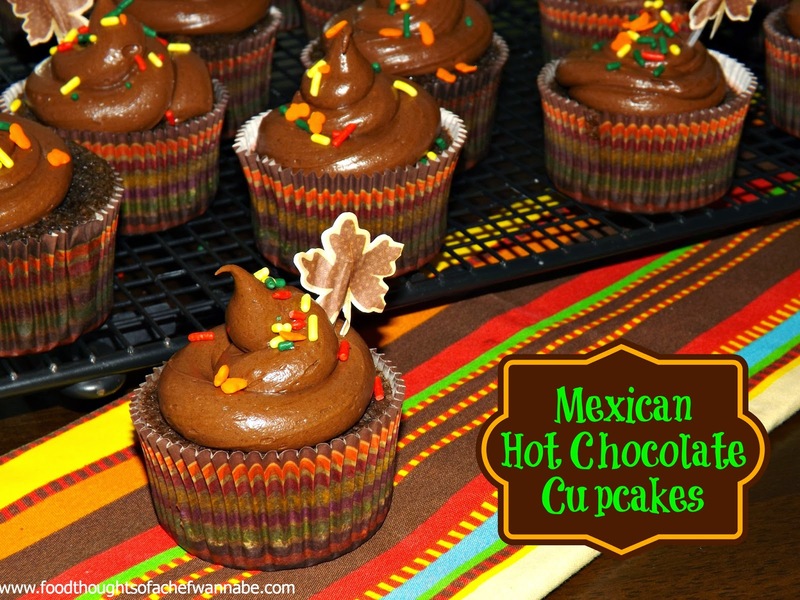 Pipe or spread icing on your cupcakes! Enjoy these unusually delicious treats! This is one of my favorites and I will be the first to admit, I am a Campbell's Tomato Soup fan. Yes, yes I am. However, if I can make it myself, with no chemicals and all that ick, why not? Will it stop me from keeping cans of it in my pantry, no, will it make me want it this way when I have what I need on hand, definitely. I made this a huge pot, and we had some for lunch today and we might have it for dinner tonight, I don't care, I LOVE it! Here is a Simmerman family tip. Do you love grilled cheese with tomato soup? Make your grilled cheese, make sure it browns maybe a bit further than you would normally take it. Now let it cool a couple of minutes, cut into cubes. Yes, that is right, cubes, then float those babies like croutons in your tomato soup. Can I get a "HELL YEAH"?!?! Sorry for the language, sometimes, I can't control it. 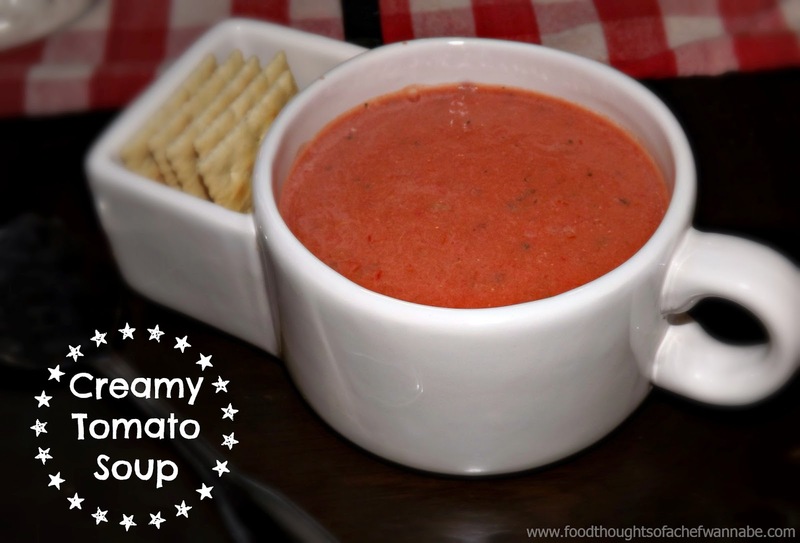 So here we go with the easiest, but so yummy creamy tomato soup. Now, even though you are using crushed tomatoes, I STILL take the time to stick my immersion blender in the soup and give it a whiz up. You don't have to by any means or you could use your blender. I think it just adds a touch more silkiness to it. Combine all ingredients in a pot. Let this simmer for 20 minutes, with the lid partially off, stirring occasionally to make sure nothing is burning. Serve with some golden brown grilled cheese, crackers or just by itself!! How can it already be this time of year? I probably say this every single year, but, the older I get the older time seems to go. My mom said it would, boy was she right. It is time to start thinking about and planning our Thanksgiving menus! While I love changing a few things up every year, there are definitely dishes that are tradition that are NOT to be messed with. Is it like that for you all as well? If I ever omitted, baked mac and cheese, or coleslaw from a holiday meal, I would be disowned! This year I am definitely looking forward to Thanksgiving, since our kids have moved here now! We get to have a real holiday together! WOOHOO! I haven't been able to spend a Thanksgiving with my son for about 6 years. We are just thrilled! With all that said, I have a pumpkin loving family. I wanted something other than a plain pumpkin cheesecake, (however, they are one of my fav's). I just decided to experiment and when it turned out, I had to test it a second time, I wasn't sure how it turned out this good, but, when I tried it for the 3rd time and my daughter in law informed me, "This is BOMB", I knew it was share worthy! 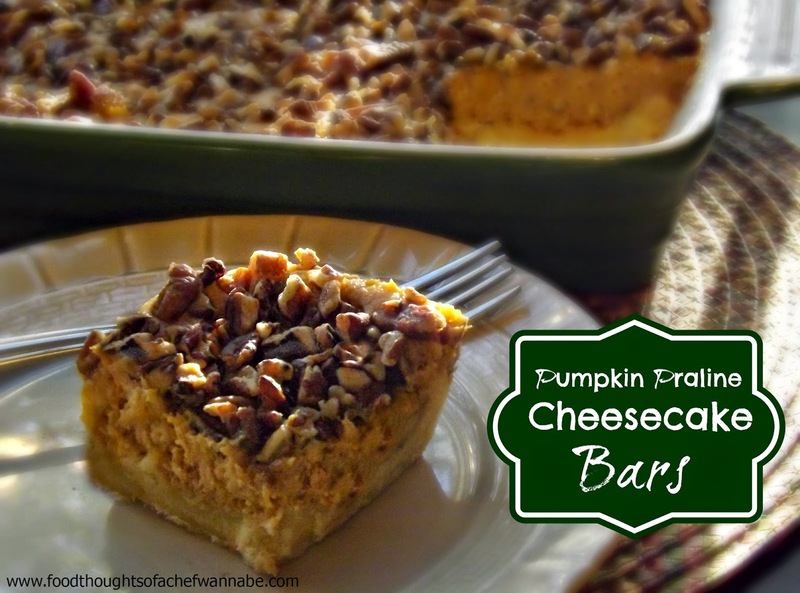 The texture is crazy awesome and the flavor, well, I mean come on, "pumpkin praline cheesecake". Pffttt, delish. I think it will be part of our Thanksgiving dessert table this year. I hope you make it part of yours too! OH! I almost forgot. The pan you will need... I used about an 7x10 or something close to that. A 9x13 will be to big, unless you double your cheesecake layer recipe. A 9x9 should work nicely. WHY did I use such an odd size? I don't know either, but I did. So just keep that in mind when picking what size to use! Preheat your oven to 350 degrees F. In a bowl combine dry cake mix and melted butter. Press into the bottom of your pan evenly and bake for 15 minutes. Remove and let cool while you mix up your filling. Combine, pumpkin puree, cream cheese, eggs, brown sugar, and vanilla extract until smooth and creamy. Pour over crust. Top with pecans, and then drizzle over your syrup. Bake for 35-40 minutes, until almost set in the middle. It will jiggle a wee bit. Remove and let sit until it is room temperature. Now chill for at LEAST 6 hours. I think it is best chilled overnight. 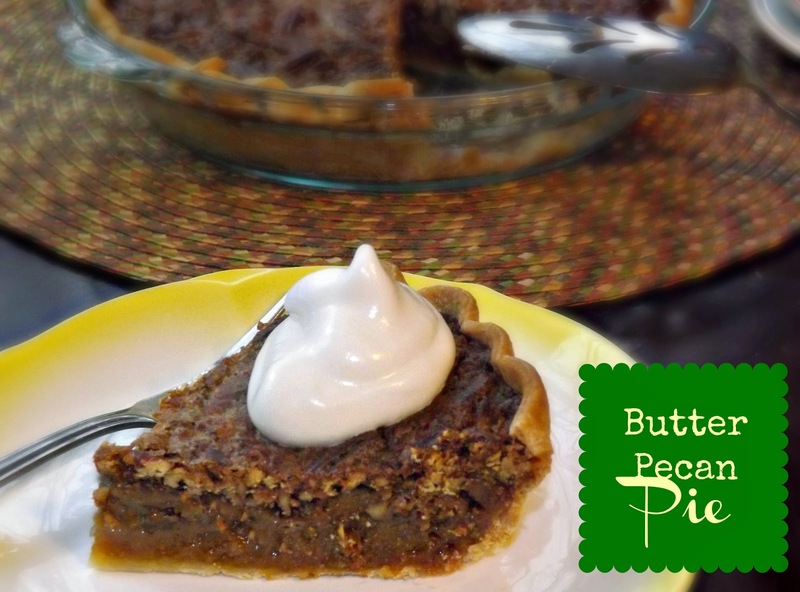 Serve with a some sweetened whipped cream, or a small scoop of ice cream even!